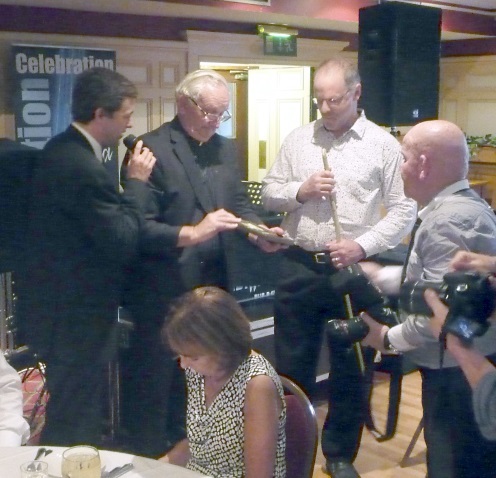 MC Mark Daly and Fr Dan Riordan with Sean Brosnahan, the new Ceann Fine. Seán is the author of The Kerrytown Brosnahans, a book about his East Kerry ancestors who emigrated to New Zealand in the mid 19th century, and lived in the area of South Canterbury known as “Kerrytown”. Sean describes his initial journey to Ireland to find his ancestral roots, details his and the many other Brosnahan families that settled in New Zealand, and includes an extensive listing of the descendents of those first Brosnahan settlers. Seán is Curator at the Toitū Otago Settlers Museum in Dunedin, New Zealand. Under Brehon Law the leaders of Irish clans were acclaimed by their kinsmen as custodians of the clan. This clan system formed the basis of society in Ireland up to the 17th century. The Ceann Fine was responsible for maintaining and protecting the clan and its property. This often meant leading his clan in battle on land and sea. In the old ages he was the military and political chief of his clan and the go-to person if someone wished to petition their regional king. The Ceann Fine would also have held all sorts of social responsibilities to his clan members, including the fertility of the land and for protecting his clan against the blight and plague of any sort. In the modern age he would provide an equally important role, that of unity and family identity, bearing importance on familial relations and establishing a deep seated sense of cultural pride. He will be often at times the only link one disparate sept of a clan shares with the larger sept, creating a sense of security and unity. My Genealogy Year 2013 ~ Accentuate the Positive!